Knowing a consistently reliable garage or a trustworthy mechanic is one of those little secrets in life which can make it all seem that much easier. If you’re in the trade, you’re almost certain to be conscious of how the advent of social media has also made customers more inclined to share their opinions about the service they receive from you and your colleagues. But as with all your dealings on social media, you have to be careful that you portray yourself and your business in the right light. Nevertheless, if you manage to do this, there’s lots of potential for it to be used as a viable channel for attracting new customers. The most important commodity you have as a garage owner or employee is your expertise - and again, this can be channelled effectively to help you position your business as an authoritative source of help and information for potential customers in your local area. The BBC published an article in which a Trading Standards officer provided tips for finding a good garage - and there are many elements of this which can be adopted by garages themselves to help them increase their credibility among actual and potential customers. As a garage owner or employee, you make it your job to know every aspect of the workings of the vehicles you work on. But there’s no escaping the fact that many relationships between garage and customer fall down because people don’t feel they have been given a proper explanation of what they’re being expected to pay for. One particular bone of contention surrounds whether a customer pays for any vehicle diagnostic check carried out in efforts to trace the source of a fault. There are no hard and fast rules governing this, so when such a test is carried out as part of a process of getting to the bottom of a problem, it’s essential that the garage is clear about its policy. Leading on from this, many faults can be discovered while performing other, perhaps unrelated, checks. So it’s good policy to have sufficiently proactive communication with a customer to allow you to flag up such problems, and offer the customer the option of having the work done there and then, or if applicable, recommending another specialist who might be better-placed to do it. Being open to letting customers state a maximum level of work they would be prepared for you to carry out (and price they’re happy to pay) without express authorisation is a way you can show that you’re sympathetic to their concerns over work costs. There’s a lot of confusion around exactly which parts should be used for many repairs, with the after-market sector increasingly crowded with companies vying to supply garages. Experience should tell you whether a part from a trusted supplier is every bit as good as one which comes direct from the manufacturer, but again, there is no substitute for getting to know these fine details - and this will probably mean spending quite a lot of time on your own research. But again, if you know your own supplier’s components are just as good as the originals, yet they cost less, you should be prepared to pass on at least some of this saving to your customers. Although, of course, you will want to factor in the time you’ve spent doing your research in the first place. When all’s said and done, your customer should appreciate that you have this knowledge, and can use it to their benefit - so be sure you’re open with them. Also, if you use reconditioned or remanufactured parts, rather than new ones, you should be prepared to state this, as this might have implications for any vehicle warranties which the owner has. Do You Mind Being Watched While You Work? It’s said that part of the reason why garages are often so mistrusted is because so much of what they do takes place out of the customer’s gaze. Of course, if you’re operating from small premises where there just isn’t the room for them to be present at all times, this is a practical issue. But on the other hand, some customers may not have anything else to do while their car is being worked on - especially as it means they have lost their mobility - so might appreciate being able to hang around while your people go about their work. There are clearly health and safety implications to having someone present on your premises who isn’t directly involved in the work done there - but you might be able to set aside a small room where a customer can sit and work, thereby meaning that they don’t have to lose any of their productive time while their car is being attended to. And with modern wireless and mobile communications, this is less of an issue than in the past, as many companies expect their staff to be willing and able to work from anywhere - so doing your bit to help them will probably be greatly appreciated. Equally, if someone has to be somewhere, say to meet a client, at a specific time, staff resources permitting, you could consider offering them a lift to where they need to be. In this way, the customer sees having their car repaired as less of a disruption to their routine, and means they can more or less carry on working as usual. The days when everyone expects a garage to be a haven for grease and grime are gone. With franchised dealers raising their game and expecting their staff to clean up as they go along, adopting similar practices in a smaller, independent garage can pay dividends. If nothing else, it shows that you take pride in how your business is perceived by its customers. It also makes it much easier for you to stay organised, and that means you’ll see the savings in terms of time and bother over a prolonged period. As cars’ service intervals are increasingly being extended, it’s vital that the right checks are carried out at the right time. So if you have a car booked in for a routine service, you need to appraise yourself of the correct schedules for that particular vehicle. Given that the vehicle might not see the inside of a garage for another two years, it’s vital that you know exactly what checks are needed for the level of maintenance you’re being expected to perform. Equally, if you find during your examination that the car would benefit from extra work, it’s always wise to let the customer know, and leave the decision over whether it’s done up to them. 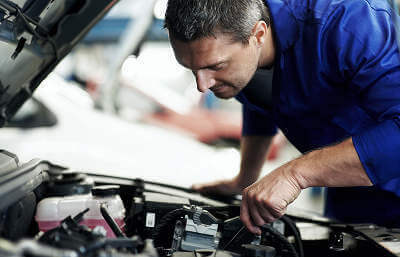 You can, though, earn yourself extra credibility by offering ‘advisories’ over tasks which are recommended for the next service - in a similar fashion to those issued when a car undergoes its MoT. This should be seen as part of your contribution to efforts to establish an ongoing relationship with a customer. Every garage needs repeat, faithful customers. Just treating each one as another ‘punter’ whom you never expect to see again won’t do you any favours in building a sustainable business. But one basic which many garages still overlook from time to time is to take detailed information about how they can contact their customers. This will help reassure them that you want to be open and honest with them. And it can also help your own efforts to be proactive in asking customers what they think of the service you have given them. Likewise, it will encourage that customer to keep your details handy, giving them good reason for staying loyal by being made to feel as though their custom matters. Taking on board the points in this article should be second nature to most garages. And if not, they can be used as the foundation for a thorough examination of your customer care practices. Customers, in turn, are more aware of their rights than ever before, so you should conduct your business with this in mind, and be sure you are up-to-date with the law as it affects your relationship with them. Finally, don't forget that customers of MyCarNeedsA.com are encouraged to leave reviews of your service and it's the garages with the most positive reviews that future customers will see and trust the most. The absolute last thing you need for your business is for a series of unsatisfied customers to post a negative review on MyCarNeedsA, as it's going to potentially harm your opportunity for future bookings. These snowball effects work both ways and in the present day when communication online and interaction online is so prevalent, it's in the best interest of customer and garage alike to snowball the good and not the bad. We’d love to hear how you try to keep relationships sweet with your customers, and whether you have any extra tips beyond those mentioned in the article. Why not visit our Facebook page and leave your comments?